안녕하세요! 캘거리 한인 헬스페어 2018 를 위한 행사 준비와 공식 자원봉사자 모집이 시작되었습니다. 뜻깊은 커뮤니티 헬스페어 봉사활동의 경험을 해보고자 하시는 분은 하단 링크를 통해 신청하실 수 있습니다. 포지션별 인원제한이 있으니 서둘러 신청해 주세요. 기타 정보나 문의는 ckhf.volunteer@gmail.com로 연락 주세요. 봉사자에게는 점심과 스낵, 봉사확인서 및 도어프라이즈 추첨 티켓이 제공됩니다. 커뮤니티 발전을 위한 제4회 캘거리 한인 헬스페어 2018 을 함께 만들어갈 많은 봉사자분들의 연락을 기다립니다. Hello everyone! 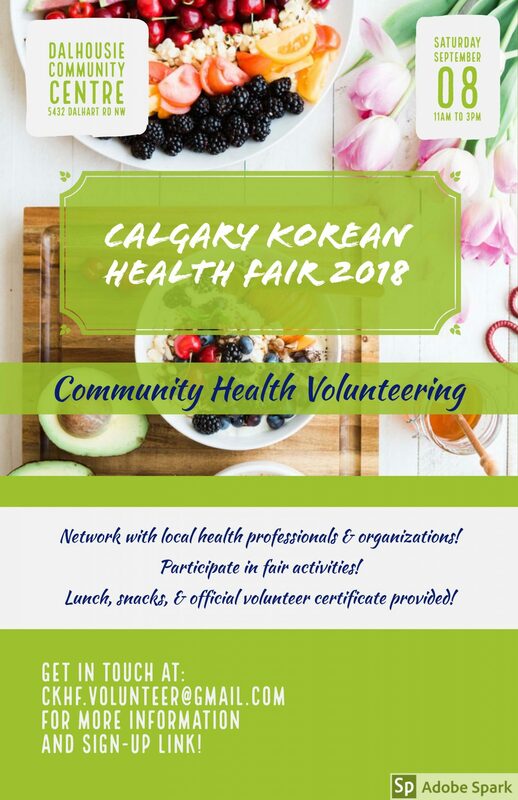 Planning for the Calgary Korean Health Fair 2018 is underway and we are officially open for volunteer applications! Register early using the link provided and be a part of another meaningful local healthcare experience. Please email ckhf.volunteer@gmail.com for more information on volunteering positions, and with any other questions you may have! As always, lunch and snacks will be provided, as well as volunteer certificates and raffle tickets for prizes.